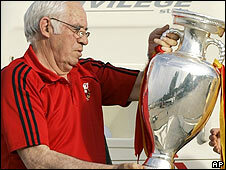 Spain's Euro 2008-winning coach Luis Aragones has signed a two-year deal to become coach of Fenerbahce. The 69-year-old, who led Spain to their first major tournament win in 44 years last month, replaces Brazilian legend Zico in charge of the Turkish club. "I am here both with my brain and heart to work for Fenerbahce," said the former Barcelona and Valencia boss. "I know I have come to a good and strong team. I can tell you that I am very happy to be here." He added: "The stadium is absolutely great and I'm sure that the atmosphere will be even more fantastic when the fans come. "However, I like to keep things calm. This season we want to win every possible title." Aragones, who has been coaching since 1974, was in charge of the Spanish national side for four years. He courted controversy on numerous occasions, not least for making offensive remarks directed at then Arsenal striker Thierry Henry in 2004 and for leaving Real Madrid legend Raul out of the Spain squad for Euro 2008.